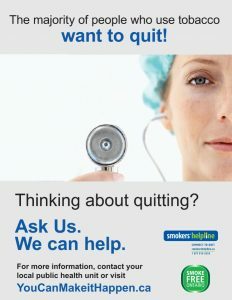 Illness can motivate tobacco users to make a quit attempt. Hospitalization presents a unique opportunity for tobacco cessation treatment across disciplines within a hospital and hospital interventions have been shown to help patients remain abstinent in the long term. There are multiple competing priorities facing Ontario hospitals. In order to gain leadership support for the integration of tobacco dependence interventions into hospital practices it is important to incorporate evidence into planning tools and discussions with decision makers. Hospital initiated tobacco dependence interventions improve successful quit rates and contribute to reductions in hospitalizations, morbidity and mortality. Post-implementation evaluation and quality improvement. Contact OMSC@ottawaheart.ca to sign up and receive the OMSC support documents to assist your hospital to implement comprehensive tobacco cessation into practice. 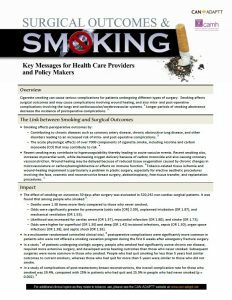 A step-by-step manual for implementing a cost-effective tobacco cessation program for hospitalized patients. Based on the Staying Free program, which has evidenced among the highest cessation rates reported in the scientific literature, this book is the result of decades of research by the authors. The tobacco cessation process is applicable to most behavioral interventions in acute- or long-term care settings. This program is used at the Thunder Bay Regional Health Sciences Centre. Fourteen hospitals across Ontario are developing and implementing an evidence-based smoking cessation intervention targeting patients with chronic diseases. These hospitals are located within 10 of the 14 Local Health Integration Networks (LHINs) and represent diverse hospital types (community hospitals, ambulatory care hospitals, teaching hospitals, rehabilitation centres, and mental health hospitals). Smoking cessation interventions incorporate the “5 A’s for Smoking Cessation” (ask, advise, assess, assist, and arrange) and facilitate patients’ access to community resources after discharge from hospital to ensure ongoing cessation support.These Hospital-Initiated Smoking Cessation Demonstration Projects are being independently evaluated to identify promising practices and lessons learned. As part of these demonstration projects, a Joint Capacity Building Working Group for Hospital-Initiated Cessation was struck to develop an evidence-based system pathway and toolkit to assist hospitals plan, implement and sustain a smoking cessation program. 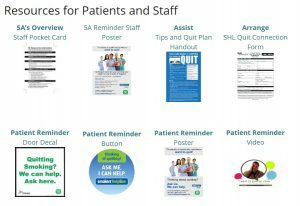 The Unified Model for Hospital-Initiated Smoking Cessation Programs Toolkit remains a living document and is currently being utilized by demonstration project sites. Once finalized, the toolkit will be disseminated more broadly. Interested hospitals can choose to implement RNAO’s smoking cessation guideline “Integrating Smoking Cessation into Daily Nursing Practice” as one of their selected guidelines under the Best Practice Spotlight Organization Program. All Regional Cancer Centres are required to implement the smoking cessation framework which utilizes the 5 As evidence-based smoking cessation intervention (ask, advise, assess, assist, arrange) to target ambulatory cancer patients seen in Regional Cancer Centres. This resource documents the lessons learned from the implementation of tobacco-free clinical and outdoor grounds policies in hospital settings. Specific examples from three hospitals are highlighted: 1) North Bay Regional Health Centre; 2) Ross Memorial Hospital; and 3) Sault Area Hospital. Communicating with staff and the public. A key messages and question and answer document. 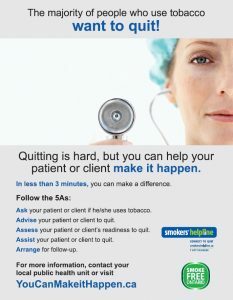 Assessment and pharmacotherapy tools exist to help you support your clients to quit tobacco use. Ontario Tobacco Research Unit (2011) Smoking cessation activities in Ontario hospitals: survey results 74% of Hospitals responded to the survey (165/224). Compare your hospital to hospital based cessation services, practices and policies in Ontario hospitals. Ontario Tobacco Research Unit (August 2013). Data Standards for Smoke-free Ontario Smoking Cessation Service Providers With a range of smoking cessation services happening in Ontario, there is a need for common measures and definitions to ensure equivalent reporting by service providers. Key data standards and definitions are provided in this document for adult (18 years of age and older) tobacco users participating in smoking cessation programs. You can utilize these data standards/questions and definitions when creating your patient assessment forms. University of Ottawa Heart Institute–Ottawa Model for Smoking Cessation. See sections 2 (Pre-implementation evaluation) and 6 (Post-implementation evaluation and quality improvement).